I. M. Dharmadasa has worked in semiconductor research since becoming a Ph.D. student at Durham University in 1977. 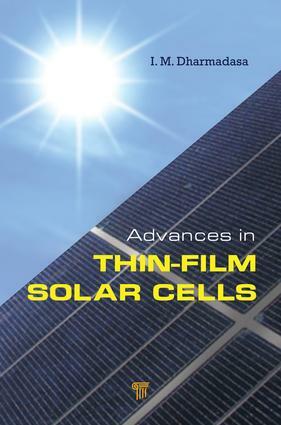 His interest in the electrodeposition of thin-film solar cells began when he joined the Appolo Project at BP Solar in 1988. He continued this area of research on joining Sheffield Hallam University in 1990. He has 80 refereed papers, six patents and over 100 conference presentations, and five book contributions, and he has successfully supervised 10 research degree candidates and nine years of PDRA support. He has gained research council and internal University funding and is currently working with a group of industrial partners (Ionotec Ltd, Pilkington plc, and ICP Solar UK) to commercialize the new research findings with the UK Government's DTI-funding. Dharmadasa is also actively involved in the public awareness work on applications of renewable energy in the society. He was the key person in initiating SAREP (South Asia Renewable Energy Programme), which is now becoming an international programme for the promotion of renewables. He is the editor of SAREP newsletter and has designed a "Village Power" programme using solar power to empower rural communities for the reduction of poverty.